Are You Paying to Cool Your Attic, Not Your Home? The question in the title may at first sound a bit strange. Why would you cool your attic at all? You almost never go up there, and there’s no reason to provide cooling (or heating) for it during the year. But the truth may surprise you—because many homeowners are accidentally paying money during the summer to send conditioned air up into their attics. They don’t mean to do it; it’s the result of a problem that’s alarmingly common in modern homes, which is ductwork suffering from air leaks. 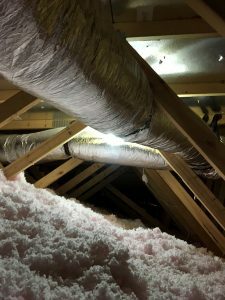 The ductwork passing through an attic (one of the easiest places to install ducts so they don’t take up space elsewhere in a house) often loses the conditioned air in it through gaps and holes. That means cooling power goes into the attic, where it’s no good to anybody in the rest of the house. So it’s possible that right now during our hot later summer here in the Central Valley that you’re paying to cool down air that’s going right into the attic rather than to the living spaces. The people in the household will receive some of the cooled air, but less than they should. (According to government studies, the loss of cooled air to duct leaks can be up to 30%.) The air conditioning system will run more often to make up for this loss, causing electrical bills to climb and placing a higher toll on the AC. Posted in Duct Sealing | Comments Off on Are You Paying to Cool Your Attic, Not Your Home? Today we’d like to focus on a part of your home that can lose heat that you may not have considered: the ductwork of the ventilation system.